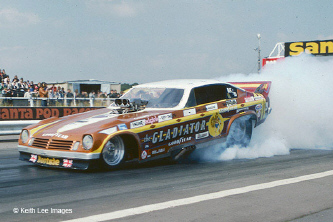 Biographical: He lost control of his car during a hot rod eliminator race after being clocked at 107.27 MPH. He crossed the finish line after which the car went sideways, went into a ditch, then flipped over on its top and burst into flames. He suffered third degree burns over 80 percent of his body. He was rushed to an Appleton hospital, then transferred to a special burn hospital in Milwaukee. He died at St. Mary's Hospital Burn Center from complications of the accident. He was from Markesan, Wisconsin. Full Name: Willie Adams, Jr.
Biographical: He died when the motorcycle he was riding collided with a car at the drag strip near Beulah, Alabama. Biographical: He was killed in a racing accident in mid-afternoon. He was the owner of Clear Lake Speed Center and lived in Friendswood. He was survived by his widow, Sheila, and two children. Biographical: After reaching a speed of almost 135 MPH, he lost control of his motorcycle. He crashed through a fence and crashed into a nearby river bank. Biographical: He had just crossed the finish line at a speed of more than 120 MPH when his vehicle veered off the race track and rolled four times. He was transported to St. Joseph's Mercy Hospital in Ann Arbor where he died about two hours after the crash. He was an auto service manager and was from Southgate, Michigan. Biographical: He was about half way down the track when his vehicle veered off the left side of the pavement, then came back onto the strip before going off on the right side. He was able to get the car back on the pavement, but it rolled over, and broke in half. He was transported to a local hospital where he died about two hours after admittance. He was a resident of Tampa, Florida. Biographical: He raced past the finish line at about 100 MPH. After his car suddenly and without explanation went out of control, it chopped down a light pole and hit the fence. It rolled over several times. He was thrown from the vehicle and suffered massive injuries. He was pronounced dead at the scene. It was thought he may have had a heart attack prior to the crash, but that was not confirmed in the autopsy. Biographical: He lost control of his car at mid-track and flipped end over end several times. A high school student in Odessa, he had set a track record the previous month at over 140 MPH. 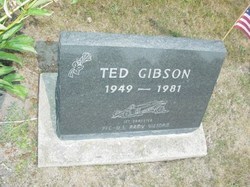 He was survived by his parents, Jack Gibson and Sandra Martin. 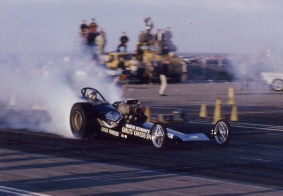 Biographical: He was racing Doug Brown's jet dragster. 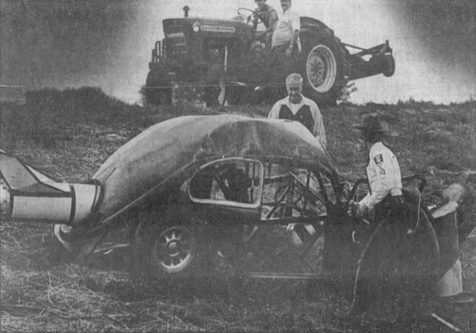 Although newspaper reports are conflicting, Gibson reportedly was near the end of the race track with his chutes deployed when his car was struck by Brown's car. The collision caused both cars to leave the race track at speeds close to 242 MPH. Gibson's car rolled several times and struck a pole. He was from Crete, Illinois. Brown escaped with minor injuries. Biographical: He was killed during qualifying when his car went out of control at the end of the track and flipped over several times. He had veered off slightly just after the finish line and his tires had spun in the grass. The car spun sideways then flipped end over end about fifteen times. 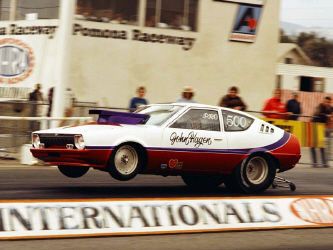 His crew chief was the later successful pro stock racer Greg Anderson. He was survived by his wife, Gerry, and sons, David and Mike. Biographical: On its debut run, the car inexplicably veered hard to the left at the top end of the drag strip and slammed in to the crash barrier. 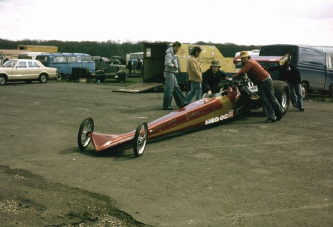 He built one of the first dragsters in the UK in 1962 and was inducted into the British Drag Racing Hall of Fame in 2006. Biographical: After crashing he was transported to Licking Memorial Hospital where he died. He lived in Licking County, Ohio and was survived by his wife, Elaine, and a young son. Biographical: The rear axle housing purportedly came out during his run and he crashed. Biographical: His car went out of control after crossing the finish line at the 1/8th mile strip and burst into flames. He was badly burned and died of internal injuries about an hour and a half after the accident at Metropolitan General Hospital. He had been trying to slow his car down to avoid breaking out of his bracket. He spun out of control, ripped through a guard rail, and flipped several times. The gas tank split and the car erupted into flames. Art Malone organized a race two weeks later to begin a memorial fund. That memorial race was an annual event for at least three years. He was an experienced racer from Tampa, Florida. Biographical: The weld on the left rear shock mount reportedly failed. The left tire locked and the car spun and flipped many times. The roll cage welds failed and the cage came off. He was killed instantly. He was from Farmingdale, New York. Biographical: During time trials, he died riding as a passenger in a car driven by Lewis Rauch at the drag strip. The car struck a light pole and turned over several times. The driver was critically injured. Matthews was from Scranton and was survived by his wife, Bobbie Jean. Biographical: He was about two-thirds of the way down the airport's runway when a high gust of wind caused him to lose control of the car when traveling at speeds approaching 150 MPH. The car tumbled across the runway. He was thrown from the car, in the process, losing his helmet. 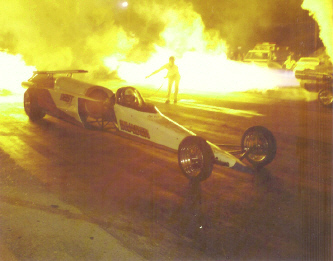 He and his partner, Raul Cabrera, had been running the car in exhibitions at drag strips since 1977. 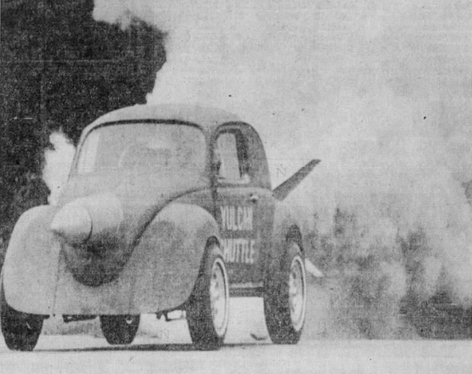 Biographical: Spilled oil on the track caused Reynolds's car to go out of control. He overturned several times. He was from Longview, Texas. Biographical: His throttle stuck and he ran off the drop off at the end of the shut down area at full speed. He had been drag racing for several years and had qualified for the Spring and Summer Nationals at Bristol the year he died. He was a lifelong resident of Kingsport, Tennessee, where he worked as a mechanic. He was survived by his wife, Joan. Biographical: While making a run against Owen Hayward, his car swerved to the left, then right where it collided into the crash barriers. During the run, he dropped cylinders on the right side, spewing oil onto the right rear slick causing the car to spin right into the guardrail. Biographical: He died after his car veered across the race track and flipped several times. He ran over two of the timing lights and may have punctured a tire. He was making a second qualifying run, trying to better his first run of 7.139 and 235.6 MPH. He was from Largo, Florida. Biographical: He lost control of his motorcycle, overturned, and struck a guardrail. He was from Dover, Pennsylvania. Biographical: Car owner Dan Foley had just completed tech inspection on his 700-horsepower car on what newspapers reported was OCIR's final race--possibly ever. He let his girlfriend, Diane Tate, take the car on a service road on a warm-up run. Although the posted speed was 10 MPH, she was going about 25 MPH when either the throttle stuck or she panicked, lost control, and crashed into a eucalyptus tree. She died at the scene of massive head injuries. Her 11-year-old nephew, Brian, was riding in the car and was also seriously injured. She lived in Victorville, California. Biographical: Thompson was trapped inside his burning car after it spun, hit a retaining wall at 75 MPH, and burst into flames. An autopsy showed that he was intoxicated. He lived in Dallas, Texas, where he managed a service station. He had been the driver of the same car and at the same race track where in 1979 he had plowed into spectators, killing four people and injuring six. He was survived by his wife, Effie. Biographical: He lost control of the car, ran off the race track, and struck a 4-inch steel pole. 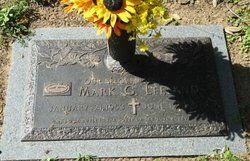 He was a manager of a car repair business and had been active in drag racing for a decade. He lived in Keymar, Maryland, and was survived by his parents and three siblings.